By Susan Abel Lieberman, Ph.D. Whereas knowledge is something we have, wisdom is something we become. I am forever grateful to Dr. Spock and all those other parenting experts whose insights helped us raise our children. But I want to tell them all that they stopped the developmental cycles too soon. They didn’t warn me that children’s marriage was yet another stage of development in the child rearing cycle for which we parents could use some guidance. Long before I was pregnant, I planned to be an excellent mother and have lovely children. Post-pregnancy, it quickly became apparent that there was a gap between wishing and executing. It took cargo loads of advice to figure out what made sense for my husband and me as we muddled through and got the babes out of diapers and into school, past fighting about the merits of bike helmets, through adolescence recalcitrance, beyond the demands of college tuition bills. Miracle of miracles, time came when they could not only buy a car without assistance, they could also pay for it. While it took decades of focused attention to write that last paragraph, the happy bottom line is that our boys grew into kind, responsible men. I thought the difficult times were behind us. The most trying decisions now would be what restaurant to choose for dinner and what time to get there. I had no idea that there was an entire new learning curve waiting just around the corner – the mother-in-law challenge. I knew that parenting would be demanding, but it never occurred to me to think my sons’ marrying would bring its own challenges. Where is Dr. Spock on this stage of development? Was I being arrogant when I unconsciously assumed that any people our children would marry would be delighted to have me as a mother-in-law? I also assumed that they would find my husband and me kind, interesting, bright and helpful. If they loved our offspring, wouldn’t they also love us? And if our children loved them, wouldn’t we think they were great? He or she is going to merge with this OTHER person. Daughters who bring home future husbands and sons who bring home future wives are introducing a foreign agent into the family mix. Men who bring home men and women who bring home women can make the situation still more complicated but the underlying issues are the same. There is no telling who will be easily assimilated and who will trigger disruption. Even if you have known these people for years, have watched them in the sixth grade pageant, have seen them dressed for the prom, have applauded their college graduation, you most likely don’t really know them YET. Up until now, they wanted to be sure you liked them. Now you need to be sure they like you. Our own children can metamorphose from cuddlers to curmudgeons. “I used to cut the crusts off my son’s peanut butter sandwiches,” reminisces one mother. “I’m not sure when he started being a stranger who speaks to me as if we just met at a board meeting.” Being a mother-in-law is not only about relating to the person our child marries. It is also about relating to our children who begin to form their own distinct families that may not replicate our values. Maybe it is like being a term-limited monarch. We are always The Mother, but our reign has run its course and policy and procedures have passed to a new administration. We may get to sit on the Council of Advisors, appreciated for our grasp of history, but we are no longer considered the highest authority. There are advantages to giving up full time parental responsibilities, but some of us want to hang on to our familiar roles. As I listen to mothers-in-law, their children and their children’s partners, it is clear that it isn’t always sweetness and light. What gets in the way? Well, the most prevalent choice is — imagine this — THEM. We mothers-in-law, I can tell you, live in the land of the righteous and just. Our children and their spouses, they are all over the map. Each generation says thank you to the past generation by investing in the next generation. Our children don’t owe us anything – in spite of the times we want to shout, “Do you remember what I did for YOU!” — but that doesn’t mean we have no expectation or they have no obligation. We want things for our children and also from our children. Mothers say, “Oh, I just want them to be happy.” Yes, but honestly, don’t we want more? I love seeing our two sons in love and contented. It is a lot. But it is not enough, at least not for me. I want to feel loved by them and their families. I want to be a part of their lives. I want communications to be easy and respectful. I want us to all have a sense of ease and openness when we are together. And I want time together. I pray my children find contentment …and that I do as well. The question that grabs me is what can we learn that will help us navigate this egg-walking adult stage of child-rearing? As I was able to learn how to parent for the most part successfully, is it possible to learn to deal successfully with being the mother of married men and women and the mother-in-law of their spouses? 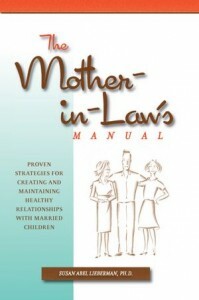 This book springs from my own determined efforts to be a successful mother-in-law which also means being a successful mother of my adult children. I have talked with dozens of women and read scores of books as part of this exploration, but much of this is my own experience laid out for others to look at and say, “Yup, that makes sense,” or, “That seems really dumb to me. I see that it would be better to do…” I have learned so much from other women over coffee as well as from my own children and their partners. I like the learning. I know it will continue.